Today’s post will be about artichokes. This has nothing to do with writing at all, except for the fact that I am writing the recipe out. To be honest, if you want to make your artichokes truly delicious, you’re going to have to roast them. (475-degree oven, covered, 35 minutes.) Cranking the oven up to 475 when it’s already 90 degrees inside the house is taking the quest for a perfect vegetable too far, and therefore, grilling makes an acceptable second choice. 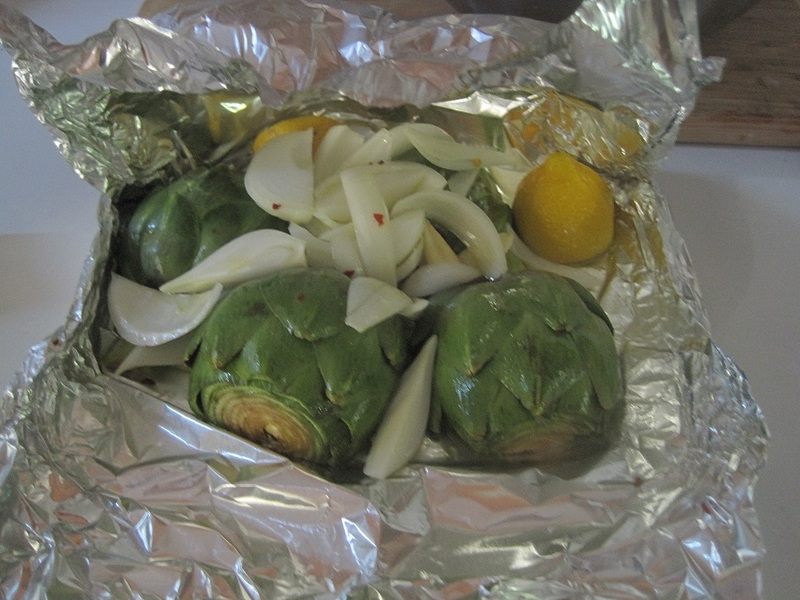 Most recipes require boiling or steaming the artichokes first and finishing them off on the grill. Forget it. I am too lazy to double cook anything, and I believe I already mentioned the ninety degree indoor temperature. So here’s what you do. 1. 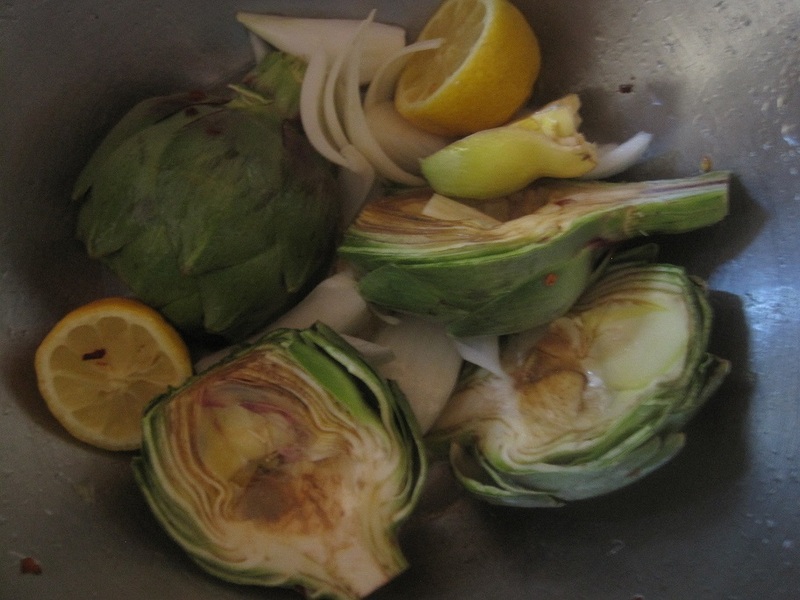 First, you make a little bath for the artichokes in a bowl: a bit of lemon juice and water. 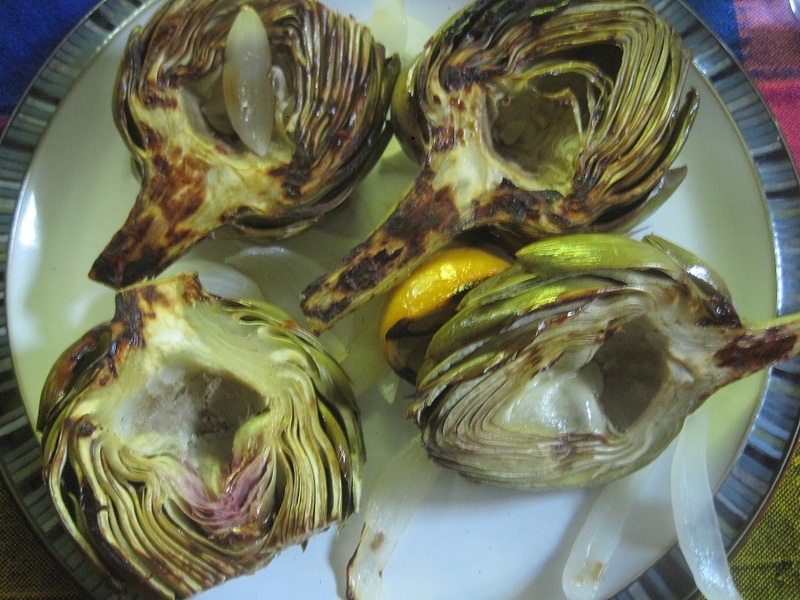 Then you cut the tops off the artichokes, slice them in half, and cut out the chokes with a paring knife. Toss those in the bath. I did not take a picture of this step, so you’ll have to try to imagine it. 2. When you’re done doing that, drain them. Toss them with olive oil (a few tablespoons, at least), some onions and garlic and lemon halves if you want, and salt and pepper. Throw in any spices you think might go well. I chose red pepper flakes. Also add water to this mix–at least 1/4 cup. 3. Put the artichoke halves in a foil packet. (Note: I do feel bad about all this foil.) Make sure there is water in there! That will help them steam a bit, allowing them to cook without burning. If you have a really hot grill, you should probably add more water. Remember, I am not a professional griller, and this is not an exact science. 4. Then grill the packets on low heat (if you have a gas grill) for 15-20 minutes on each side. I didn’t take a picture of this, either, because it would just be a picture of a foil packet on a barbecue. I cooked them for 15 on each side and the outer leaves were still a bit tough. The heart was perfect, though.